Featuring a crisp, linear silhouette, The GROHE Eurocube tap introduces true square design to the kitchen, while an eye-catching cut-out detail on the lever enhances its architectural appeal. Naturally, Eurocube also benefits from two of GROHE's leading technologies: GROHE SilkMove, for comfortable and precise control of the water flow and GROHE StarLight for an intense chrome shine, which resists dirt and tarnishing and highlights its minimalist form. 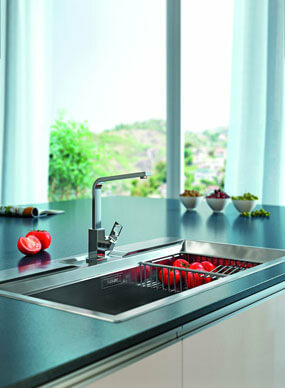 The functional shape of the Foster FL One sink alludes to its characteristic Italian style. It incorporates a preventative sink overflow function that effectively acts as a safety solution. Featuring a spacious bowl at 71 cm wide, it will allow you to meet all of your washing requirements, giving you ample space to wash all your cooking equipment.